The A-Z of Birding is my latest book… published 17th August 2013! If you want a signed copy remit the necessary amount – £8.99p plus P&P of £2.01p for UK (Total: £11.00p) or email me if you are in the US is P$P £7.43p (Total for the signed book works out at $26 at today’s exchange rate – its actuall less than on Amazon US!) and Australia £8.01p or £5.08 if you want to wait six or eight weeks! Leave a message with your name and address via the feedback form… or buy through PayPal in US Dollars or British Pounds. The author brings all of his trademark charm and humor to bear in a delightful alphabetical memoir, combining the lighthearted and the thoughtful to make a really appealing book. The self-deprecating style can get a bit repetitive – but then you come upon the splendid account of Bo trying to grab a much-needed smoke on arrival at Los Angeles and all is forgiven. …a catalogue of anecdotes and observations from a lifetime spent birding around the world, shot through with a rich vein of wit and self-deprecating humour. When you look through the alphabetical sections of this tome some of you may suspect that this whole book as a pathetic framework to hang all my anecdotes on, a farrago and a cynical attempt to fool people into buying a book believing it to be a helpful study of birds. Frankly I am shocked and hurt that you should think so little of me… this book is certainly not such a transparent and fraudulent pot-boiler – it is all of those things of course, but so much more too! It is also a way of crowing about my birding fortunes to more than just a handful of mates down the pub. Moreover, I am hoping to follow this book with another collection and fully intend to steal other people’s anecdotes and add them to a few more of my boring stories that I have ‘improved’. I can do no other as I had the greatest respect for my late parents and Dad always said to me, ‘Son, never spoil a good story by over enthusiastically sticking to the truth. None of the family made it in life by relying on veracity’. I think it was George Bernard Shaw who said ‘He who can does, he who cannot, teaches’. (Judging by most of my secondary school tutors he was not a million miles from the mark!) It may well be that he who can birdwatch well does, and those of us that caught the birding bug but never managed to fully hone their skills, write about it. 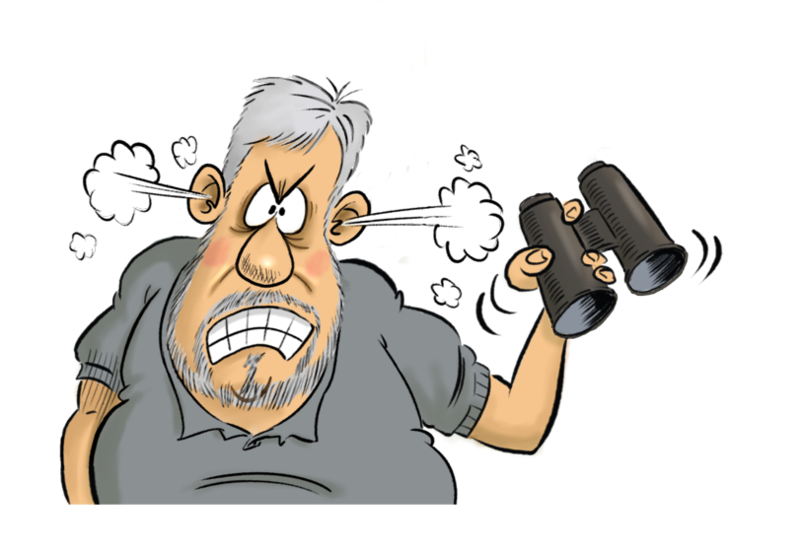 If you go out birding, see everything you set out to see, get the ID right first time and never mispronounce a name or wrongly call a bird on a sea-watch, you may well be some of the most boring people on the planet. Even if you are not, the chances are that your stories will be. Who wants to hear all about success? Its like all those people who harp on about why the TV news is all bad and ‘why can’t they give us some good news sometimes?’ The short answer is we would all turn off. Bad news re-assures us that, no matter how many reasons we have to whine, we are bound to be better off than some poor bugger somewhere! It also warns us of what is probably on the way to our door if we don’t barricade it. Since setting up Fatbirder in 1999 I have reviewed, literally hundreds of books. I have read some excellent stuff, but much of what I have waded through has been dross. Some of the very worst are about how great a time certain birders had seeing birds that I can only dream about. On the other hand I’ve read a couple of terrific books by complete losers and very much enjoyed some self-deprecating and humorous types who refuse to take themselves seriously. Hopefully, I never make the mistake of taking myself seriously, and I certainly do not make the mistake of taking anyone else that way either.